Food Basics Current Flyer valid Thu Aug 24 - Wed Aug 30, 2017. 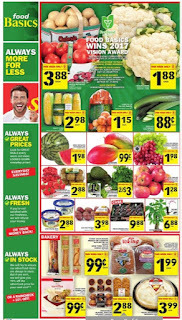 Food basics circular, food basics store flyer for this week and view food basics flyer on this category. 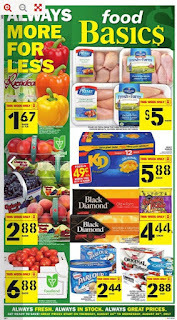 This week's food basics flyer to help give you an idea of what's available this week. Mini Seedless Watermelon $1.98 - on price Product of USA. Mangoes $0.99 - on price Product of Mexico. Strawberries Raspberries Kiwi $2.88 - on price Strawberries 454 g product of USA no 1 grade raspberries product of USA no 1 grade 170 g kiwi 2 lb product of Chile. Coriander/Cilantro Avocado 2/$3.00 - on price Coriander/cilantro product of Canada avocado product of Mexico. Fuji Apples $1.28/lb - on price Product of Chile extra fancy grade. $2.82/kg. Stone Oven Baked French Or Ciabatta Baguettes Or Deleo New York Style Garlic Bread $0.99 - on price 284-325 g.
Dimpflmeier Rye Bread Or French Stick $1.99 - on price 454-680 g. Selected varieties. Villaggio Dempster's Bagels, Dempster's 7" Tortillas, Dempster's Smart, Smooth Multigrains, Dempster's Burger Buns, Dempster's Hot Dog Buns, Dempster's White, 100% Whole Wheat Breads, Dempster's Wholegrain Breads 3/$7.00 Regular Price /$5.00 - on price. (Mix any vachon snack cakes, selected varieties, villaggio dempster's bagels, dempster's 7" tortillas, dempster's smart, smooth multigrains, dempster's burger buns, dempster's hot dog buns, dempster's white, 100% whole wheat breads, dempster's wholegrain breads 272-675 g. The bread event mix & match). View product and price detail by click here Food Basics Flyer Canada. 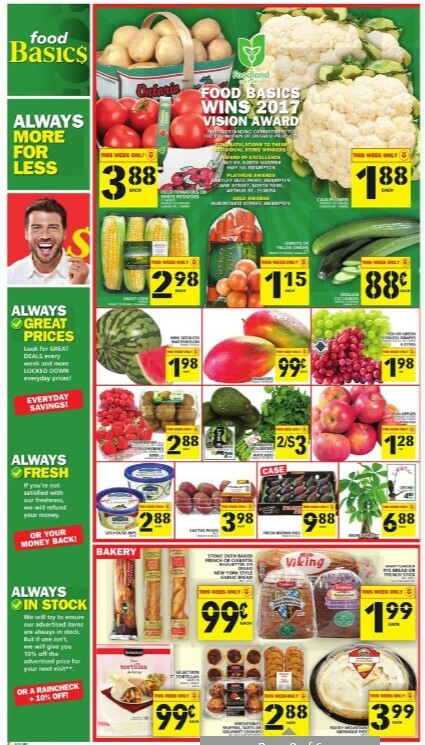 Learn about all store flyers, this week's flyers, top food flyers, also find on this site about loblaws flyer grocery store flyers online.